The Color dialog box is a standard Microsoft® Windows® interface, but it is available in so many places in SiteSpinner® Pro that it we are compelled to discuss it in this help guide. Use it to set red, green, and blue values for various objects and components. Ubiquitous and useful, the Color dialog box allows you to select system or custom colors to apply to many different objects and components in SiteSpinner® Pro. You may open the Color dialog box any time you have the option of setting system or custom colors for an object, component, or text. Basic colors Click to select one of the 48 basic (or system) colors to apply to a selected object, component, or text. Custom colors Click to select one of the 16 custom colors to apply to a selected object, component, or text. Define Custom Colors Click to expand the Color dialog box to allow you to choose and set a custom color. Color Matrix Click anywhere to define a color. The selected color will appear in the Color/Solid preview window, and its Red, Green, and Blue and Hue, Saturation, and Luminance values will appear in the fields below the Color Matrix. HSV slider Click and drag up or down to change the Hue, Saturation, and Luminance values of the selected color from the Color Matrix. The new values will appear in the Hue, Sat, and Lum boxes. Color/Solid Displays a preview of a custom color. Hue Displays the hue value of a color. If you change the hue, the values for red, green, and blue will be changed to match. Values range from 0 to 239. You may enter a value. Sat Displays the saturation value of a color. Saturation is the strength or purity of color in a specified hue, up to a maximum of 240. The higher the saturation, the purer the color. You may enter a value. Lum Displays the saturation value of a color. Saturation is the strength or purity of color in a specified hue, up to a maximum of 240. The higher the saturation, the purer the color. You may enter a value. Red Displays the value of the red channel in a color. You may enter a value. Green Displays the value of the green channel in a color. You may enter a value. Blue Displays the value of the blue channel in a color. You may enter a value. Add to Custom Colors Click to add the custom color you have defined to custom colors where you may click to apply it to the selected object, component, or text. The Shading Editor dialog box will open. Click the Create button. A message box will appear asking you to confirm that you want to create a new shading component. Click Yes. The message box will close. Rename the shading component, if you wish, by overwriting the system-defined name in the Current Shading combo box. Click the Fill Settings Tab. 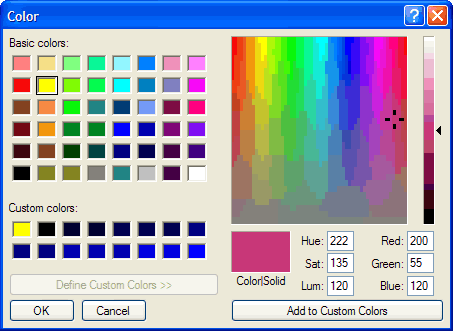 Click the Color button to open the Color dialog box to select a system or custom color. When you are finished, click OK. The dialog box will close, and the new flat color fill shading component is loaded and ready to apply to objects. New shading components bearing the same attributes of the newly created shading component will be created automatically and applied to new rectangle and ellipse objects that you add. To apply a radial gradient, click the Radial button. When you are finished, click OK. The dialog box will close, and the new gradient fill shading component is loaded and ready to apply to objects. To repeat the image without scaling until the entire object is filled, click the Tile button. Browse your system for the image file you want to use for the image fill. The Open dialog box will close, and the selected image will appear in the Preview Window of the Shading Editor dialog box. When you are finished, click OK. The dialog box will close, and the new image fill (texture map) shading component is loaded and ready to apply to objects. If you are creating an image fill shading component to apply to a polygon where the lines of the shape cross each other to form closed sections (e.g., a pentastar), you can use the Fill Method option on the Selection Tab to select either Alternate or Winding fill methods. Alternate will leave the middle part of the object empty, while Winding will fill all parts of the object. Select the object to which you want to apply a shading component. From the Shading Selection drop-down menu, select the shading component you wish to apply to the selected object. A preview of the shading component will appear in the Thumbnail View and in the object itself in the Work Window. Not all types of shading components can be applied to all objects. Check the preview of the object itself in the Work Window to see if it will accept the desired shading component. Click the image object whose brightness and/or contrast you want to adjust. The Red, Green, and Blue sliders will now controlled together. To adjust the image’s contrast, click the Contrast button. Click and drag either the Red, Green, or Blue slider right or left to increase or decrease the brightness or contrast settings. The image will display the effects of the settings in the Thumbnail View. When you are finished, click OK. The dialog box will close, and the image object will reflect the new settings. Click and drag the Red, Green, and Blue sliders right or left to apply different tint effects.